ORLANDO, Fla. (WOFL FOX 35 ORLANDO) - An Orlando judge on Wednesday ruled that Michelle Parker's family can re-file their wrongful death lawsuit against Parker's estranged fiancé, Dale Smith. Parker disappeared in 2011, right after dropping off her twins at their father's house in Orlando. The judge asked for more facts regarding their wrongful death lawsuit. "It was a good day for us," said John Dill, the attorney for Parker's family. The family's lawyer said the judge ruled their suit can be re-filed as long as they strengthen their argument. "I'm happy that it wasn't dismissed," said Lauren Erickson, Parker's sister. "I never thought it would be dismissed." Parker's family was inside the hearing room at the Orange County Courthouse, but Smith wasn't there. He wasn't legally required to attend the hearing. Smith is the prime suspect in her disappearance, but he has never been charged. He also now has custody of her twins. "There's an extreme lack of fairness," said Erickson. "We had four people taken from us that day. I lost my oldest nephew. I lost my niece and my nephew that are the twins. I lost my sister." Tom Sadaka, Smith's attorney, argued the lawsuit should be dismissed because of a lack of evidence. Parker's family hopes forcing Smith to take the stand will give them answers. "He has the option to plead the fifth," said Erickson. "And if he chooses to plead the fifth, in my opinion, guilty people plead the fifth." Parker, the mother of three children, disappeared Nov. 17, 2011. While her vehicle and cellphone were found, there has been no trace of her despite extensive searches. Judge John Kest said the attorney for Parker's family can file the amended complaint with more evidence and argument to bolster their claim that Parker is dead and that Smith, who is the father of Parker's twins, made that happen. Smith was not in court on Wednesday, however his attorney acknowledged in court that his client is the only person of interest in the case. He also said the lawsuit should not continue because there is no death certificate or evidence to support the claims from Parker's family. "There's no death certificate, no determination from the Board of Health Miss Parker is actually deceased," said attorney Tom Sadaka. Parker's family sat in court wearing shirts with Parker's face on them. Her family hopes by one day putting Smith under oath in the case, it will give them more answers, though he is expected to take the Fifth Amendment if and when that day comes. "He has the option to plead the Fifth, but if he does, in my opinion, guilty people plead the Fifth," said Parker's sister Lauren Erickson. The family plans to re-file the complaint within 10 days. Michelle Parker's family still wants to know why she vanished in more than two years ago. Investigators maintain to this day that Parker's ex-fiance, Dale Smith, is a person of interest, despite the fact he's never been charged. Last year, attorneys for Parker's family filed a wrongful death suit against Smith, hoping that will force him to talk about the case under oath. But Smith's attorneys said there's no evidence linking him with Parker's disappearance, and asked a judge Wednesday in Orange County to dismiss the wrongful death suit. "There is no death certificate," said Smith's attorney, Tom Sadaka. "There's been no determination by the court or by the Department of Health that Ms. Parker is actually deceased." Orange County Civil Court Judge John Marshall Kest dismissed the suit, but added he would "leave to amend," allowing attorneys for Parker's family to change some legal language in the suit and refile it. "He hasn't dismissed the case, so we're pushing forward with the case," said John Dill, representing Michelle Parker's family. "He's going to address the issue of whether the deposition should move forward, which we feel it will." Dill has 10 days to refile the wrongful death civil suit. Meanwhile, the criminal investigation into Parker's disappearance continues. Investigators say they continue to get new leads every day, but so far, there have been no arrests. Parker's mother, Yvonne Stewart, has been also fighting to see her grandchildren, who remain in Smith's custody. Smith has moved out of state for a job, and Stewart was hoping that a grandparents' rights bill would pass in the Florida Legislature. That bill, however, died last week in a Senate judiciary committee. Michelle Parker's ex-fiancé, Dale Smith, wanted lawsuit thrown out. The lawsuit brought by Michelle Parker's family against the primary suspect in her disappearance will continue, though a judge on Wednesday told the family's lawyers to re-file their suit with more specifics. Michelle Parker, a mother of three, disappeared in November 2011 after dropping off her young twins with their father, her ex-fiancé Dale Smith, who was later identified by Orlando police as the prime suspect. Months of searching failed to find Parker, whose case attracted national attention. Parker's family filed a wrongful death suit against Smith last year, though he has never been charged with a crime in the case. In a hearing Wednesday, Smith's attorney Thomas Sadaka argued the lawsuit should be dismissed — because Parker's family has provided no proof that she is actually dead. "There is no death certificate, there has been no determination by a court or by the Department Of Health," Sadaka argued. The Parker family's lawyer, John Dill, countered that a judge in Seminole County had ruled on that issue, in an order allowing Parker's mother, Yvonne Stewart, to represent the missing young mother's estate. Seminole Circuit Judge Nancy Alley "made a determination that death occurred," Dill said. Circuit Judge John Marshall Kest, who's overseeing the lawsuit, raised his own issue with the suit, which he called "strange." Kest said the suit didn't allege clearly enough exactly how Smith caused Parker's death. Kest granted Sadaka's motion to dismiss the suit, but gave Dill leave to amend it. Dill made clear he intends to do so, and later told reporters the lawsuit wasn't in jeopardy: "I never thought he case would go away," he said, adding his goal is to get "some answers and some justice for this family." A search for Michelle Parker, an Orlando mother of three who has been missing since 2011 resumed on Friday, Feb. 26. More than three years after Parker went missing, investigators, as part of a training exercise, searched in the location of Lee Vista and Semoran Boulevard. Friday’s search location was in a wooded area on the edge of Orlando International Airport, which is just west of the location where Parker’s phone last pinged. Unfortunately, Sgt. Wanda Ford, Orlando police spokeswoman said nothing significant was found during the search. 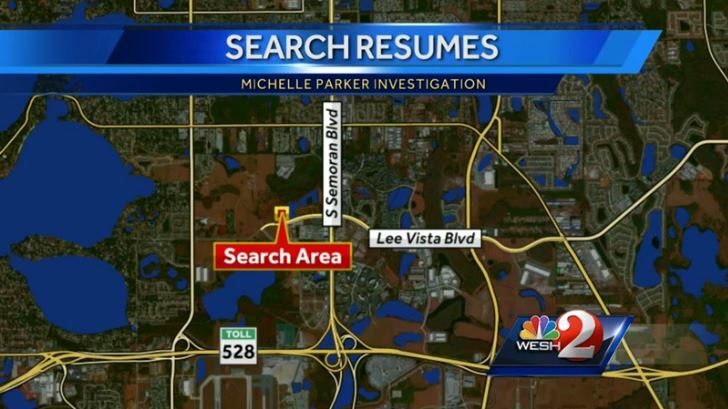 Investigators in the disappearance of Michelle Parker searched in the area of Lee Vista and Semoran Boulevard, near the Orlando International Airport, for about three hours. Parker vanished in November 2011 after dropping off her young twins with her ex-fiancé, Dale Smith. Smith has been named a suspect in the case, but has not been charged. More Departments should do this as part of a training exercises!!!!! Page created in 6.123 seconds with 21 queries.